November makes Prague a bit chilly, so it's best to dive into a cosy pub or wine cellar and taste the first wine of 2017 - the St.Martin wines. Have the traditional Czech roasted goose to accompany your wine degustation and then take a stroll through the autumn streets of the city. Taste the season's first St. Martin's wine, pair it with roasted goose and enjoy true autumn atmosphere. Planning a hen do in Prague with your BFFs? Take them for a prosecco bike ride. Want to try? Order your own prosecco bike experience. 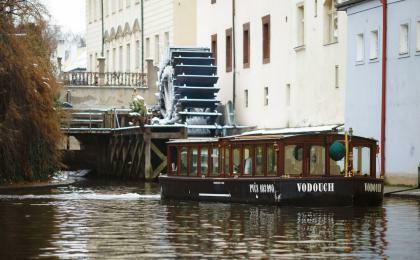 Try Czech specialities and craft beer aboard a steamer on the Vltava river. Want to try? Order your own beer tour experience. Surfing in Prague? Yes it´s a real thing! Have fun and practice for summer. Want to try? Order your own indoor surfing arena experience. Coming to Prague with a bunch of friends? 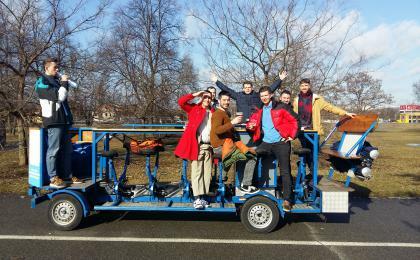 Move around the city on your very own beer bike. Want to try? Order your own beer bike experience. As it gets colder, outdoor activities are slowly sidelined and the season of feasting starts for the Czechs. The hedonist part of the year starts with the St. Martin goose and St. Martin wine. Try them out at one of Prague's restaurants (almost all of them have a special St. Martin's offer) or at one of many St. Martin festivals around the republic - a nice excuse why to visit Brno, Olomouc or Český Krumlov, where the best wine festivals take place. Are you a jazz and world music fan? The Struny Podzimu festival (Strings of Autumn) continues till the 9th of November in many clubs and venues around Prague. Looking for a contemporary music experience? Check out some of the most progressive Prague clubs like the Roxy with its classic Free Mondays, Palác Akropolis with Czech and foreign rock bands or the Cross club with a program designed to please techno lovers so as other alternative style lovers. A must see of November is Krištof Kintěra's Nervous Trees exhibition ending on the 26th of November at the progressive Rudolfinum gallery. It's free and it's absolutely dazzling! See modern art in a neorenaissance ambiance of the Rudolfinum palace. You want more? Then head to the Trade Fair Palace to see exhibitions of the controversial Ai Wei Wei or to see the most recent artwork of Julian Rosefeldt - his Manifesto. The weather lures us to have a nice meal and drink in the warm indoors, but what if you need your daily dose of action while in Prague? 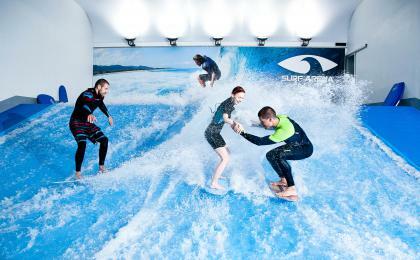 Learn how to surf at an indoor surfing arena! A patient instructor will show you all the tricks and when summer comes, you'll be ready to show of on the beach. 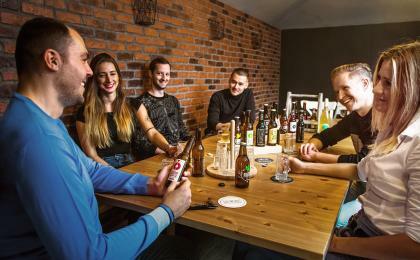 Those who would still prefer to dive into typical Czech hedonism but want a little physical activity should definitely go for the beer bike ride through Prague streets and parks. Those looking for a new perspective while trying Czech specialities will love the boat degustation menu activity. St. Martin festivities: Go out for a St. Martin menu or join the wine-loving crowds at one of the St. Martin festivals. Struny Podzimu: Check out the programme and tune to autumn's melancholic tones with tens of talented jazz players. Nervous Trees: Get inspired by Krištof Kintěra's bionic universe, where trees tremble with nervousness and old washing machines become a piece of art.